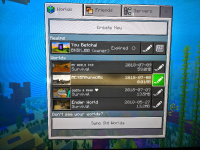 12-Nov-18 - For those still having issues with their worlds not showing in the world list - In many cases the actual save data is still present on the device, so the advice from the developers in not to uninstall or delete the game data, as we are working on a fix that should enable the saves to be recognised and show in the list again correctly. Just did the 2nd half of the aquatic update. When I went to load my world's I noticed my big world with a ton of work was renamed/deleted. Can this be fixed???? The world that's highlighted in my picture was never there before, and my big world over 700mbs is gone. ???? EDIT** I JUST INSTALLED THE NEWEST UPDATE 1.5.3 AND LOADED THE WORD THAT WAS MESSED UP AND IT IS NOW RESTORED PROPERLY!!!! EVERYTHING HAS COME BACK!!! 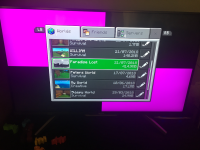 THANK YOU SOOOOO MUCH MOJANG! THANK YOU THANK YOU THANK YOU!!!! MCPE-35863 Lost my xbox one better together minecraft world. MCPE-36040 When trying to search worlds in the Storage section, the screen freezes, one of my worlds disappeared. MCPE-39080 Lost world when loaded game next day? MCPE-33114 I Have noticed a huge flaw in the bedrock saves. None are safe.